The wider shot above gives us a pretty good view of the corner that houses Cook’s Apple Store-style desk. 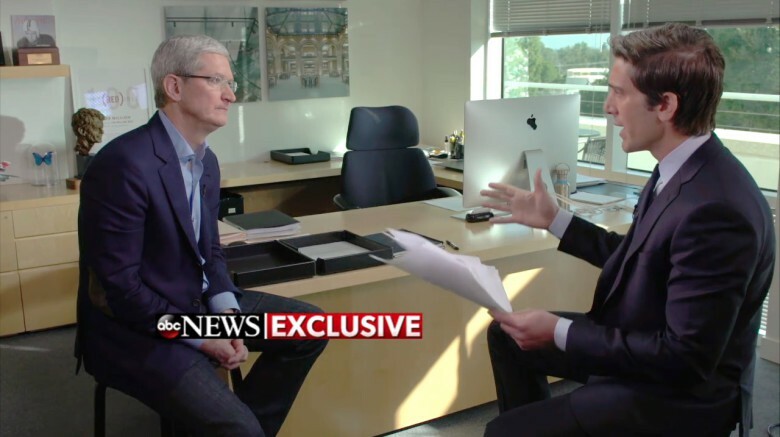 He has the regular desk stuff on there — pens, papers, a giant iMac and what appears to be a 12-inch MacBook hanging out in the corner. 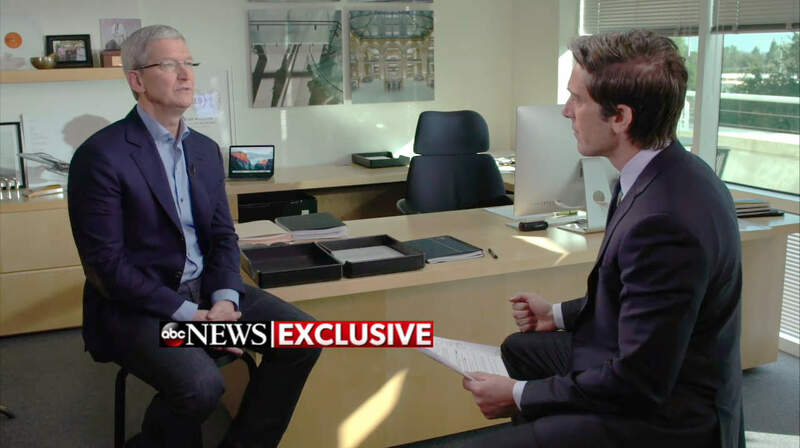 We aren’t ruling out the possibility that someone from the corporate office maybe suggested Cook keep the laptop open and showing the homescreen so we could see it throughout the interview. As far as we can tell, the thing makes it through the entire half-hour interview without going to sleep or starting a screensaver. So that was either some sly product placement, or Cook really likes that default desktop. 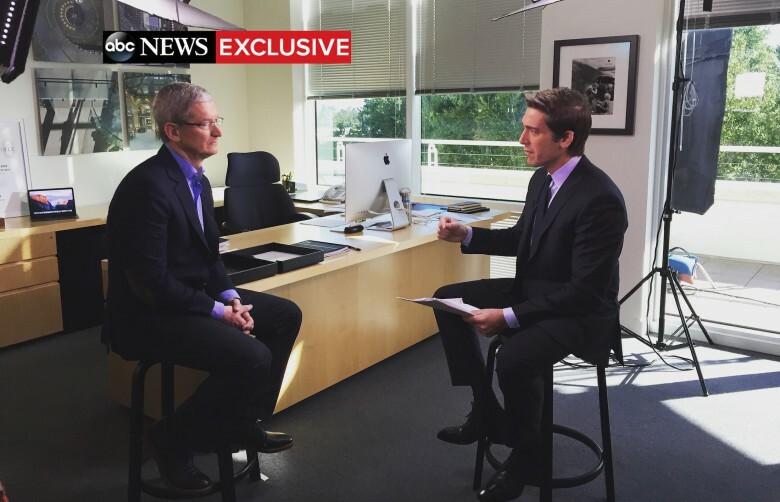 If we want to get really granular here, we can also point out that the Apple CEO appears to keep a Klean Kanteen water bottle behind his main computer. Maybe he walks around there to get a drink when his Apple Watch reminds him to stand up. That MacBook really is obvious, isn’t it. 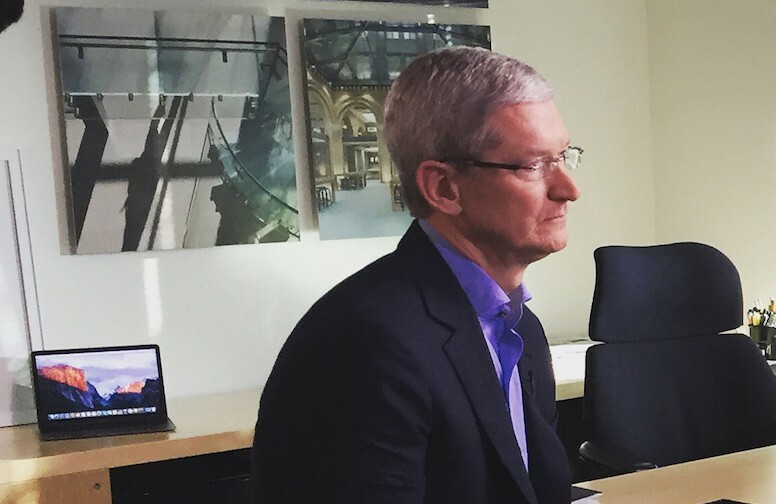 On the wall behind Cook — and above his conspicuous MacBook — you can see some cool pictures of various Apple Store locations. We can’t see them well enough to tell exactly which stores they are, and the glass staircases and walls aren’t helping us narrow it down much. They look really cool, though. You’ll forgive us for not being able to see that well from here. Our eyes have already started crossing. The last thing we wanted to point out in this shot is the framed artwork behind Muir. It looks like a sample from Apple’s “Think Different” campaign, which launched almost 20 years ago, but we don’t recognize the photo, and it kind of appears that the text might say “Work Different.” But we had to stop looking after a while because that is how migraines happen. Moving on to the area behind Cook in the photo above, we have some more personal belongings. You can see a poster from U2 lead singer Bono’s AIDS charity Product (RED), probably in honor of Cook’s $50 million donation a few years ago. It’s sitting right next to that just really obvious MacBook. Next to that is where Cook keeps the Ripple of Hope award he brought home from the Robert F. Kennedy Center for Justice and Human Rights last December (they gave it to him; don’t worry). Up above, you can see the Winter 2011 issue of Auburn Magazine, the official publication of Cook’s alma mater. And he probably especially likes that copy because it has an article about his promotion to Apple CEO in it. We can’t quite place the fighter jet or what appears to be a vinyl record with an orange label that show up elsewhere on the desk, but if you have any insight into what those are, be sure to let us know in the comments. 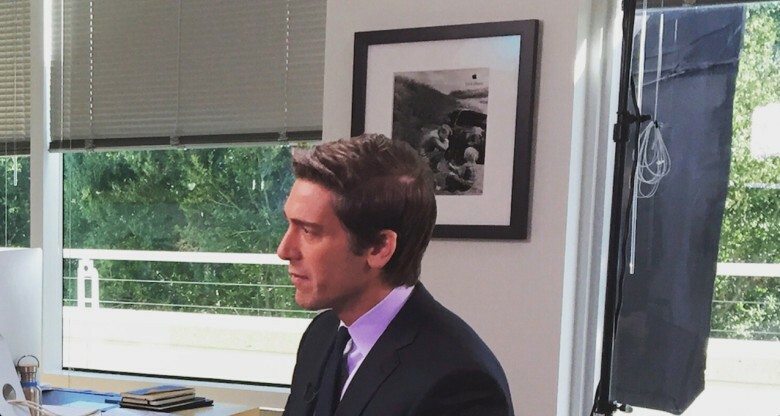 This will have to do until we get our own tour of Tim Cook’s office, but we aren’t holding out much hope here because even David Muir was shocked to be in there.